I make snarky comments like this a lot, but talking to readers yesterday, it was made abundantly clear that this whole “value” crusade I thought was totally obvious is actually clear as mud. It makes an excellent excuse for an article though, right? Today I’m going to talk generally about age and transfer values, and then specifically about how Manchester City are going about this summer all wrong. One of the problems I have with who Manchester City have purchased this summer is the age of their targets. Ignore the fact that they seem to be overpaying for players no other teams were in for, I want to focus on why paying big money for players age 28 or older is just bad strategy, even when your owners swim through vaults of gold every morning. This seems like a good place to start because it’s one of the areas that seems to cause the most confusion. What is the aging curve? And it’s commonly used to project how players will continue to produce as they age. Baseball is lucky in that they had hundreds of thousands of player seasons to analyse and project future player development. Unfortunately for football, it lived in an information stone age for most of the sport’s life. Despite the fact the game has been played professionally for over 100 years, the only detailed data we can access on player seasons goes back about um… five. Ow. This isn’t to say that every player will experience this decline. As Ben noted in his Top 10 Forward Seasons article, the best performance from the last six years was from a 31-year-old. 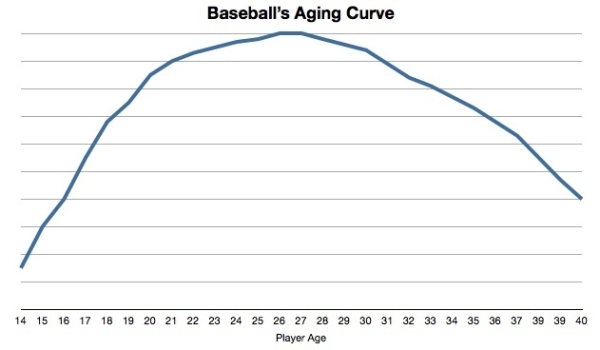 However, the aging curve is real, and it’s something teams definitely need to keep in mind when buying transfer targets. Let’s take the exact same average forward and break him into two time eras. In one era, he is transferred after a breakout season when he is 23 years old. In the second era, he transfers after yet another good season when he’s 27 years old, so the buying team is getting a 24-year-old in one era, and a 28-year-old in the other. Both times our example player signs a four-year contract. I’ve done a bit of smoothing to Ben’s data, but those are the basic averages for goals per 90 across a broader population, multiplied by a 38 game season. Ignoring price completely, buying the older player lowers the production you are likely to receive by about 22-25%. Elite clubs expect more from their forwards though. What about if we apply this to someone with a higher level of output? This would take a forward who averaged 20 goals per season during their peak (an excellent rate), and instead return 15 goals per year. That difference turns what was an elite forward during their peak into merely a good one. World class players are in short supply and fantastically expensive. Good ones are prevalent, and cost far less. Thus it would also lop a massive amount of money off any potential transfer fee for performance reasons alone. What’s interesting is that the actual output expectation of the 30 and older years is likely far worse for the entire forward population you measured back at age 22. The seasons recorded in the studies are biased toward guys who were still playing solid minutes at forward age 30 and beyond. Most of them were outstanding performers in their earlier years and still playing at a high level in the Premier League as they passed through 30. That doesn’t include all of the guys who dropped off the map due to injury, transferred to easier leagues, or who were replaced by better, younger candidates on their own teams. The PL is now hugely competitive for positional spots, and most teams show no sentiment in chucking older players aside for ones that can generally help them win now. This is the other big reason transfer values should decrease massively as players get older. A 26-year-old player with two years left on their contract can usually be resold for the full amount if a club finds them to be surplus requirements. A 30-year-old in the same situation cannot. At age 27, Dimitar Berbatov cost Manchester United £30M to secure his services. Aged 31, and only one season removed from one of the best performances by a forward in recent EPL history, he moved to Fulham for only £4M. David Villa is a similar case study, and these are the guys who were still pretty good at goalscoring at the time of their moves. For ones that suffer a sharper age-related decline, their salaries are sunk costs. Every season, every football team in the world has finite resources. Even if their owners are willing to spend limitless amounts of money on transfer fees and wages, they have at least one thing they cannot change: playing time. League seasons have the exact same amount of minutes to be filled. Cup runs will be of varying lengths, but even those have a hard maximum of minutes to be played. In reality, every player budget is fixed as well. Teams have a total budget they are willing to spend on player fees and potential transfers, which is then adjusted by the players they sell, and that’s it. This is especially true now that the Premier League has instituted a new soft cap on salary growth. What this means is that signing any one player has an opportunity cost in the form of a) their wages and b) playing time. Minutes are finite. Money to be spent on wages is also finite. Buying and playing one guy excludes you from playing another at the same position. For Champions League purposes, roster spots are also finite. You only get 25 dudes, and even the ones you can name there have some restrictions about locality. Why do we care about this from a value perspective? Because wages and playing time given to declining players over the age of 30 cannot be given to their time-shifted, better performing dopplegangers who are only 25 or 26 years old. Would you rather your team played the guy who will return 100% on his performance potential or the exact same guy returning 75%? Premier League titles are won by the finest of margins. A 22-25% decline in goal difference last year would have been enough to take the league leaders to third. This stuff matters. As I write this, Alvaro Negredo has been reported as signed by Spanish media for 25M Euros plus 3M in bonuses, so somewhere between £21.5 and £24M. He turns 28 in August. 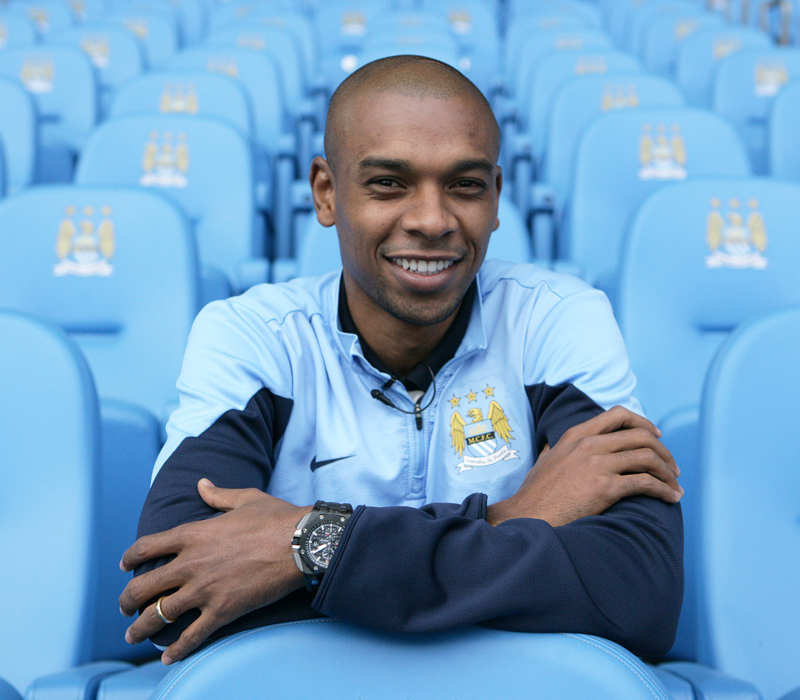 They also signed Jesus Navas this summer for £15M plus bonuses (turns 28 in November), and Fernandinho for £30M, who turned 28 in May. That’s a total minimum outlay on transfer fees alone of £76M for players who are already in decline. Look, I think all of them are good players, but that £76M paid will be more like £20M in retained value when these guys turn 30, which is only two summers from now. Additionally, by that time they will likely take minutes from players who could contribute better performances for the team as a whole, simply because they are younger. There is a correct way to buy older players that you think can help your team – at a discount. What City have been doing this summer ain’t it. If City wanted to things correctly, they should have paid more for guys who were 23-25, but who would have been entering the peaks of their aging curves. They would have retained a ton of value at the end of their contracts, and not forced replacements for performance reasons 2-3 seasons from now (and at additional cost, but one that is hard to calculate). Instead they overpaid for guys that are 28 now, will need to be replaced sooner rather than later, and will have almost no residual value halfway through their contracts. City’s owners may be richer than God, but their recent buying spree isn’t logically or analytically sound. It practically ignores the fact that they’ll need every bit of edge they can get this season and in the years to come to further stock the trophy case.